* Moronfade Christian Adebayo, often referred to as Fade Adebayo, is continuing his brilliant form at Bukola Babes FC. Adebayo is a central defender and the captain of the team. He is also well-known for his clinical free kicks. Adebayo has four goals to his name so far this season. This makes him number three on the top scorer list of Bukola Babes FC – after Abdulrahman Bashir (6 goals) and Effiom Otu Bassey (5 goals). Bukola Babes FC has lost several good players during the transfer window and will be depending on key players such as Adebayo, right-back Cletus Promise James, playmaker Bassey, winger Abdulkadir Aminu and striker Bashir. * It can now be confirmed that Onyekachi Akakem, the exciting central defender, has joined Heartland FC from Ocean Boys FC. Heartland FC has also signed experienced defender Emeka Emedosi, formerly of Enugu Rangers FC and Enyimba FC. * It can also be confirmed that attacking midfielder Femi Ajayi, arguably the most exciting prospect at Crown FC, is born 01.10.1992 and is a former player of the Emmanuel Amunike Soccer Academy. His full name is Oluwafemi Ajayi. * Several attacking players in the Nigeria Premier League 2010-2011 are in good form at the time of writing. Taofeek Akanbi of Crown FC has scored five goals in ten matches. So far it is difficult to find Burly striker Sakibu Atanda (born 20.03.1988) has scored three goals in three matches since joining Sunshine Stars FC from Enyimba FC. Victor Michael of Dolphins FC has scored four goals in the last six matches. Some Nigerian journalists have lately confused Victor Michael with Andrew Michael of Sharks FC. Victor Michael of Dolphins FC is a strong, lanky striker, formerly of Gombe United FC and Enyimba FC. Andrew Michael (born 04.08.1992) is a bulky striker who joined Sharks FC from Ocean Boys FC. He has already scored his first goal for his new club. Attacking midfielder Musa Buhari and versatile attacker Nafiu Ibrahim is in top form at Kano Pillars FC. Both players are usually fringe players at the club, but have been on fire lately. Buhari was signed from Dabo Babes FC before the season. Some reports suggests that Ibrahim was signed from FC Abuja before the season, but it is a fact that a player called “Nafiu Ibrahim” played for Pillars also in the season 2009-2010. Ibrahim has scored three goals in the last four matches, while Buhari has two in the last three. Kabiru Sanusi has scored an amazing tally of 10 goals during the last 12 matches for Kwara United FC. The experienced striker, who some reports wrongfully described as 19-year old, is my personal bet for the top scorer award for the 2010-2011 season. Sibi Gwar (born 09.09.1987), who I wrote about on 19.05.2011, has scored six goals in four matches for Niger Tornadoes FC. George Akpabio of Plateau United FC has scored five goals in the last 10 matches. His partnership with the exciting prospect Amos Emmanuel Odafe is getting better and better. Akpabio has been remarkable consistent all season for the struggling club. Brendan Ogbu of Enugu Rangers FC has scored seven goals in the last nine matches. 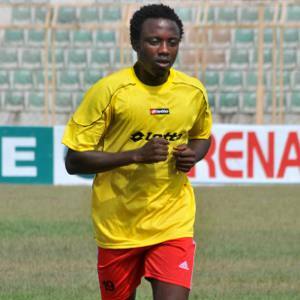 Ogbu has been described as a 18-year old striker in recent reports. * Sharks FC has made some interesting signings. Veteran midfielder Emmanuel Ebiede (born 27.03.1976), formerly of SC Heerenveen(Netherlands), MS Ashdod(Israel), as well as several other clubs in Europe and the Middle East, joined Sharks FC from Bayelsa United FC where he faced relegation in 2009-2010. Emmanuel Efosa Ikhimhin (born 14.10.1989) is a striker, formerly of Shooting Stars FC and Finnish side OPS Oulu, where he played 10 matches and scored two goals in 2010. Ikhimhin played for the Nigeria U-20 national football team in 2009. Sharks FC will also enjoy the services of striker Peter Obiorah, formerly of Kaduna United FC and Enugu Rangers FC. Obiorah was brilliant for Kaduna United FC in 2008-2009 but has struggled to impress ever since. The most interesting newcomer is perhaps goalkeeper Ikechukwu Ezenwa (born 16.10.1988), signed from Heartland FC. Ezenwa is highly regarded in Nigerian football and is well known for his sharp reflexes. Ezenwa struggled to get playing time at Heartland FC because of the brilliance of Akpan Bassey (born 06.01.1984), but will face tough competition from Okiemute Odah (born 23.11.1988) at Sharks FC. * Experienced and hard-tackling left-back Mine Ojo has joined Warri Wolves FC from Enugu Rangers FC. * Three players from the Nigeria Premier League 2010-2011 were earlier this month included in the squad of the Nigeria U-23 national football team. Attacking midfielder Ayo Saka, presented in my post from 06.11.2010, is still pulling the strings at Ocean Boys FC, especially since Christopher Chigozie left the club for Dolphins FC. Goalkeeper Olufemi Thomas (born 05.08.1989) is also at Ocean Boys FC and is arguably one of the best goalkeepers in the Nigeria Premier League. Osas Okoro, the star striker of Heartland FC, is the last player. Okoro has not had a very impressive season but he is obviously a talented player. So far he has scored four goals in the Nigeria Premier League 2010-2011, but only one since December 2010. Nigeria U-23 will play an international friendly against Costa Rica later today. The picture is of Fade Adebayo from Bukola Babes FC and is taken from SuperSport. Publisher just to commend you of the job you are doing here exposing West African Footballers to the World. Can you get intouch with me for further discussions on your website? Thank you.